Swarovski – An Austrian Success Story. 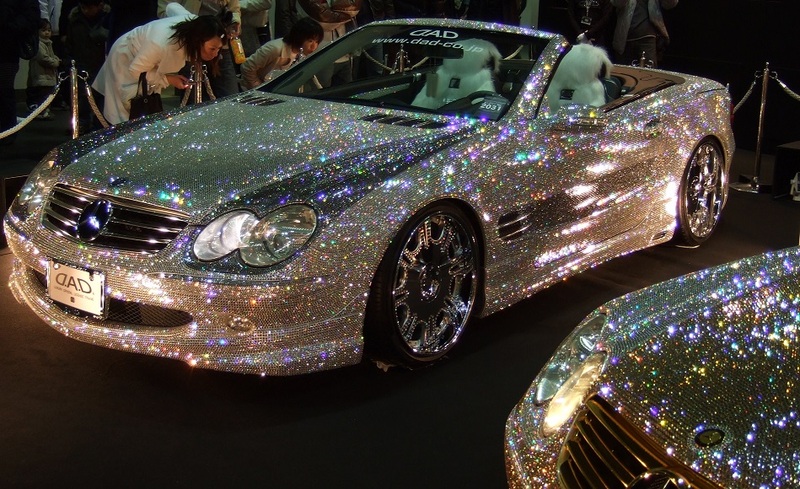 Mercedes Benz SL600 customised with a million glittering Swarovski crystals. Swarovski is one of Austria’s greatest success stories. Established in 1895 in Wattens, Tyrol a small town in Austria, Swarovski has gone from strength to strength. Daniel Swarovski, the founder of Swarovski’s initial objective was ‘to create a diamond for everyone’ which is still being realised today. From the average person in the street to celebrities, fashion designers and architects; a Swarovski crystal makes everything look more beautiful. From the design of the original crystal cutting machine to today’s cutting edge technology, innovation has remained a key driver for the company since its inception. Sew on stones, crystal studded ribbons, and crystal mesh have been a few of the revolutionary and first-to-market products over the years. The ‘Aurora Borealis’ crystal, which resulted from a collaboration with Christian Dior in the 1950s, remains a stunning and sought after jewel even in modern day. The Xilion cut crystal was introduced in 2004 and showcased a new level of brilliance. A more recent innovation is the ‘Diamond Leaf’ crystal which resulted from a partnership with Giorgio Armani. Swarovski learned very early in the game that partnerships and working with high profile celebrities and companies would work well. Swarovski has collaborated with high end fashion designers from the 1900’s onwards and have worked with everyone from Callot and Paquin Doucet in the 1920’s, to current day designers CHANEL and LANVIN. Marilyn Monroe’s dress which she wore to serenade President Kennedy on his birthday was encrusted with thousands of Swarovski crystals. Branding was originally not a core concern for the company but in recent times, a clear brand has been created in order to compete with cheaper crystals available from China and other markets. The Swarovski swan logo is well recognized around the world and appears on each piece manufactured by the company since its introduction in 1988. Swarovski crystal products are considered to be luxurious items even though they can be obtained at a very affordable price. I recently spotted a stunning pair of drop diamond earrings on a girlfriend and she was proud to say that they were Swarovski and the same pair she wore for her wedding. If these earrings were made with real diamonds they would be absolutely out of the reach of the average person on the street. An amazingly beautiful product at a great price is one of the main reasons why Swarovski has been so successful. Swarovski looks to have a bright future as the company continues to focus on their key success factors above. Start-up companies would do well to study Swarovski’s success strategies and model these features. If you are interested in company set up in Austria or other jurisdictions around the world, please contact Healy Consultants Group PLC for cost effective solutions at .